E. P. Taylor was a natural. As passionate about horses as he was about business, everything he touched turned to gold. Taylor built Windfields Farm into one of the world’s greatest centres of Thoroughbred racing and breeding. His legendary racehorse Northern Dancer was the first Canadian-bred horse to win the Kentucky Derby in 1964, and went on to become one of the greatest sires of the 20th century. Through racing trophies, photographs and memorabilia, you will discover that E. P. Taylor definitely had the Midas touch. Photos: E.P. Taylor (left) with Northern Dancer and trainer Horatio Luro. 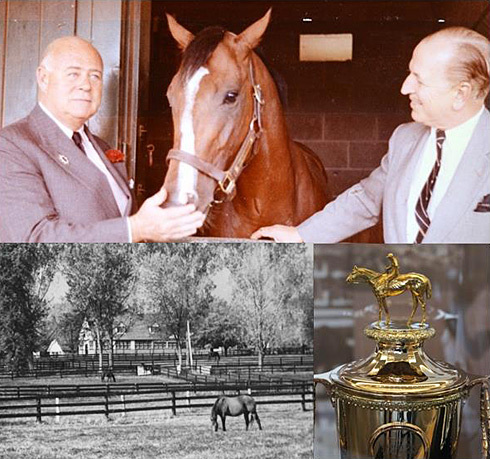 Courtesy of Jefferson Mappin; Windfields Farm Photo © Winant Bros. Inc., Baltimore, MD, Courtesy of the Canadian Horse Racing Hall of Fame; The Kentucky Derby Gold Cup 1964, won by Northern Dancer in 1964, Canadian Museum of History, photo Ryan McCosham, IMG2013-0170-0018-Dm. To learn more about E.P. Taylor, Windfields Farm and Northern Dancer visit the Canadian Horse Racing Hall of Fame at www.canadianhorseracinghalloffame.com.